I don’t know about you, but the recent freezing temperatures have done terrible things to my lips. My pout is dry, chapped, and uncomfortable – and regular doses of lip balm aren’t enough to get it back into its usual smooth and supple condition. Wearing lipstick with chapped, peeling, or cracked lips is a big no no – and with so many makeup trends for Spring/Summer 2012 focusing on colourful pouts, that’s not good news for the warmer months ahead. You might think that the cause of your cracked lips is lack of lip balm – but it’s far more closely linked to the hydration levels inside your body. Drinking lots of water is key to keeping lips in good condition and if you have been neglecting your intake, your lips will often be the first place to show it. Tip: Keep a 1.5 litre bottle of water on your desk at work (no need to go for mineral water every time – you can top it up from the drinking water tap in the kitchen) and work your way through it during the 9-5. If your lips are peeling and covered in dry patches, they need to be exfoliated before you can go near that tube of lipstick. As the dead skin builds up, your lips feel drier and less supple, making them prone to cracking too. Tip: Make sure you exfoliate your lips – I recommend three times a week, which is regular enough to keep them smooth, but infrequent enough to prevent sensitivity. There’s a range of great lip scrubs on the market, but I find it easier (and cheaper) to stick to an old toothbrush. Simply rub it gently over lips to remove any dead skin on the surface. Once you’ve exfoliated, it’s time to bring an intensive treatment into the regime, which will help to repair the surface of lips, whilst also softening and soothing. 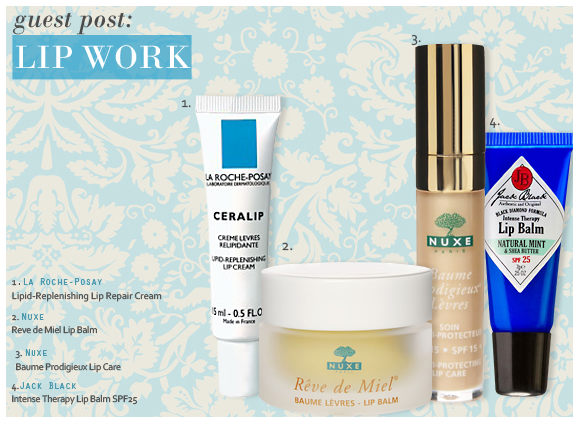 Tip: For very cracked lips, I recommend La Roche-Posay Ceralip Lip Repair Cream, £6.15. It’s specifically targeted to those with dry, sensitive lips, with a gentle formula that instantly softens and smoothes. If the damage isn’t too bad, I also love Nuxe Reve de Miel Honey Lip Balm, £9.50 – the rich, silky formula rehydrates, smoothes, and softens pouts in seconds. Environmental damage – such as sun, wind, and freezing temperatures – has a big part to play in cracked and damaged pouts. So if you are heading out, make sure that you have a protective lip balm containing SPF stashed in your handbag and reapply regularly. Tip: Instead of lip-gloss, I love Nuxe Baume Prodigieux Levres Nutri-Protecting Lip Care SPF15, £15, which is available in sheer colours of Natural Crystal, Legendaire Pink, and Charismatic Red. If you prefer a clear formula, Jack Black Intense Therapy Lip Balm, £7.25, is a great choice – enriched with natural mint, avocado oil, shea butter, and green tea to soothe and nourish. This is the perfect overnight balm for extremely chapped lips. I have always suffered from dry lips and found I was constantly applying balms throughout the day or my lips would be left cracked and sore. Until I started using this! You only need a tiny amount of product to create a thick layer that lasts all night. By morning all the product has disappeared leaving my lips super moisturised ALL DAY. This is now the only balm I need to use. Wouldn't be without it. 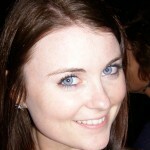 This entry was posted on Monday, February 20th, 2012 at 10:09 am and is filed under Guest bloggers, Skincare. You can follow any responses to this entry through the RSS 2.0 feed. You can skip to the end and leave a response. Pinging is currently not allowed.